Named after insect-devouring bull bats that hovered over the plains, the University of Nebraska sports teams were once known as the Bugeaters. Around 1900, a local Lincoln sportswriter grew tired of the unglamorous term and referred to the University of Nebraska has “Cornhuskers,” taking the name from a casual reference to the University of Iowa. The name never stuck in Iowa, but it quickly grew popular in Lincoln and has been the official nickname of the school ever since. 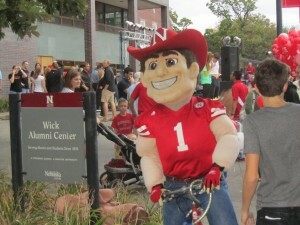 UNL boasts two active mascots that support it during sporting events. Herbie Husker became the first official mascot of UNL after appearing on a Husker magazine in the 1970s. Herbie was created in the image of the populace of Nebraska as a whole, currently sporting a red polo top, work boots and blue jeans. 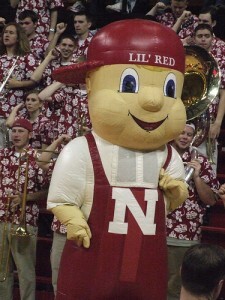 Lil’ Red is a secondary mascot created in the early 1990s as a result of UNL wanting to feature another mascot at Basketball and Volleyball games. Lil’ Red’s outfit is an inflatable suit that allows for crowd-surfing and more acrobatic maneuvers than Herbie.